How can anything so bad for you make you feel so good? And yet I turn up at the De Ronde van Cork TT league to do it all again. All on a course suited for a good warm-up but rarely am I in time for that prerequisite. The competitors and participants banter, pay their dues, hastily limber up and set their minds to a good time. When ready, fearing missing their slot and not sure of the penalties for same, riders disrobe to their racing attire (ensuring numbered armbands on the left) and approach the faint start line on the ground, the precursor to pain. Then, helpfully steadied by the starters’ grasp of bike, stopwatch and psychology, the last seconds count down; 10 means focus; 5 means really focus. And off. Breathe. My De Ronde van Cork TT league TT’s in numbers: Five times I’ve committed myself to the pain of it and five times I’ve appreciated the organisation, stewards, timekeepers and, vanity admits, photographers. Four times I’ve left wondering could I do better next time. 3 times I rode an OldVelos vintage lo-pro Frontiera time trial bike. Twice I’ve ridden my age-sake Alan. Twice too, I froze in wet weather and both times forgot spare socks. 1 time I had a tasty BBQ. All times I’ve appreciated the camaraderie of the riders. Not once did I beat 22.30. 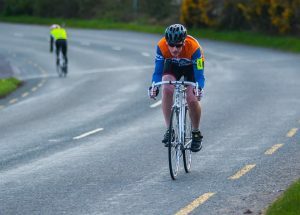 (I did however have the pleasure of this post to the Midleton Cycling & Triathlon Club club page: “Just two seconds between the 4 Midleton riders at the De Ronde TT last night….Aj was second, and I was second last”). Others ride faster, better, quicker. But all on the same asphalt. Always good to start in a gear that sets you off cruising. The first furlong is in front of the other riders and possibly photographers so that demands concentration, hopefully rhythm too. Then the first descent, shifting the gears to their maximum inches and every time too late in realising that this is not a descent, it’s just the gateway to the 174 foot Annacarton ‘drag’. Drag gear lever back and myself up. Should I really have the presence of mind to notice that the council are leaving roadside foliage reclaim the old Dublin road climbing lane? Eventually the top, and ask myself why haven’t I been caught, it had seemed I’d stopped. Back down the gears and down the road, only to face the next ascent. I’ve usually been caught by here, sometimes caught twice, once three times. Yikes, but somehow the passing rider offers a new tempo or short-term goal and enough distraction to bring me up and around the turning point and the roadside encouragement of the keepers of the cone. Next story Time is running out to enter the OldVelos Vintage Classic!! !